Use the Application for Records Retention Form to describe the content of the records to be stored, length of time to retain records, regulations, and so on. This Application for Records Retention Form is included in editable Word format that can be customized in Word or by using the included Wizard software. Company Name Application for Records Retention Form. Describe the content of the records to be stored such as: Invoices, Contracts, Sales Orders, Bid Documents, Annual Review, etc. (1, 3, 7, 10 year) Legal Regulations. (SOX, HIPPA, PCI, etc. (Physical or Electronic) Search Metadata Access Requirements Estimated Volume. (pages or file size) 1. 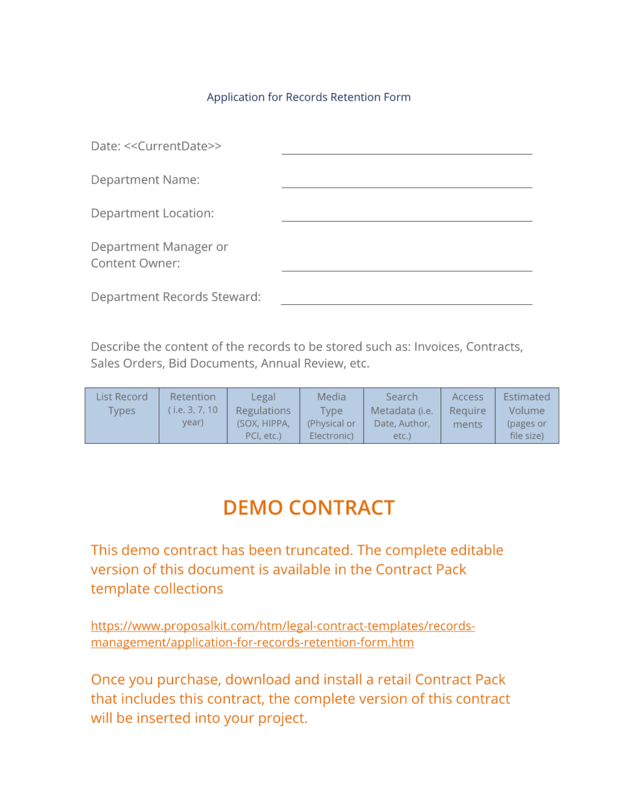 The complete Application for Records Retention Form - with the actual formatting and layout - is available in this Contract Pack.